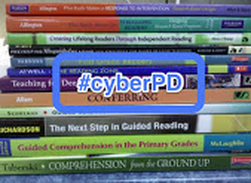 For the next few weeks I will be participating in #cyberpd, a virtual book talk. I am excited to take part in this community of educators for the first time. 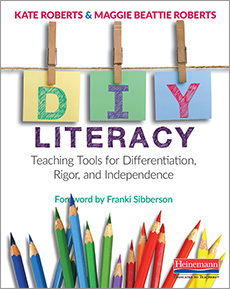 This summer we are reading the book DIY Literacy: Teaching Tools for Differentiation, Rigor, and Independence by Kate Roberts and Maggie Beattie Roberts. I will be posting weekly reflections on the chapters we are reading. I am looking forward to the learning from the book and everyone in the #cyberpd community. As a reading specialist I have a great interest in reading professional books on the teaching of literacy. I heard a lot of buzz about DIY Literacy when it hit the bookshelves, but with so many great books out there it wasn’t actually on my immediate to-be-read list. It wasn’t until the announcement that the book was the pick for #cybperpd that I ordered it. I’ve lurked around previous summer’s #cyberpd book chats and I had decided this was the year to finally participate. This is the reason that DIY Literacy made it into my hands and after reading just the first few chapters I am so glad that it did. To be honest, I wasn’t quite sure of the focus of DIY Literacy. DIY…do it yourself…what in the world is do it yourself literacy? If I had paid more attention to the subtitle of the book, specifically the word independence, I would have been drawn to this book sooner. So many, many times I have heard teachers discuss the challenges of getting students to be independent. I wrote my dissertation about how teachers support struggling writers and one of the themes that emerged from my research was that struggling writers do not apply what they have learned to their independent writing. Our goal is for all our students to be proficient readers and writers. Our students can’t get to proficiency without independence. This book is all about how to support learners so they can do it themselves – read, write, and learn on their own. My experiences and conversations with teachers indicate that there is a need for this book and I’m sure it would also be relevant to other educators, who are most likely having similar experiences and conversations and facing the same sorts of challenges as they strive to create independent literacy learners. The second chapter explains each of the types of tools that will support students’ learning. Of the tools discussed, the teaching chart is the one that I am familiar with and use in my teaching. The demonstration notebook is a tool that I have recently become aware of, but have not taken the time to create. Micro-progressions of skills is a tool that I think would be very useful in my teaching. Micro-progressions provide students with model texts at different skill levels so they can self-assess and have a guide for their work. Bookmarks, the final tool discussed in the chapter provide students with a way to record the tips and strategies they find useful for their learning. As I read this chapter I envisioned how these tools would help my students. As I reflect on my teaching, I know there are times in which my students forget what to do. There are also times when I feel like I’ve taught a strategy (through an explanation or demonstration and guided practice), but my students still have difficulty using the strategy on their own. I imagine these tools would help my students know what to do and help me remember to be very explicit about what I’m asking students to do. When students use these tools they will have a greater opportunity to engage in decision-making about their work and their learning and help them be in control of their own learning giving them a sense of agency. After reading this chapter I wanted to immediately start making some of these tools, but these tools will be most beneficial when created in collaboration with students. This collaboration will give students more ownership of their learning and increase the likelihood that they engage in the strategies taught to them. The bonus chapter made me feel like the authors were reading my mind. As I read chapter two, I was thinking, “What strategies?” and “How do I break these strategies down for students?” Resources mentioned, such as the Reading Strategies Book by Jennifer Serravallo, will be useful for figuring out the “what”. I imagine the “how” is going to take more thinking to figure out. I liked the explicit steps the authors gave to get to the how: perform the skill, study and name what you did, use kid-friendly language to explain the strategy. I may create my own tool, such as a bookmark, with these steps so I remember to observe and think about my own use of reading and writing strategies. “…we know deep down that when our kids aren’t engaged, or learning, or growing, there is something they are not getting from us that they need” (p. 2). “True learning happens when students get the instruction that fits their needs, have the agency and motivation to work hard, and remember and recycle what they’ve learned” (p. 2). “Teaching tools can be the star charts of your classroom, the seemingly simple things that cause great positive change” (p. 3). “Teaching tools help teach students the way, so that someday they will know the way on their own, like the road home” (p. 11). Next week I'll post a reflection about chapters three and four of DIY Literacy, as the #cyberpd community continues discussing the book. Hooray for joining the group this summer. I appreciate how you thought about slowing down on creating the tools. I've been thinking about taking some baby steps on microprogressiins. Thanks for sharing you thinking. Baby steps can be a good thing! I shared your enthusiasm about wanting to make tools right away... and then slowed myself down to realize that the tools do need to come out of student need. Is there a particular tool that you are feeling most drawn to? I loved all the tools, but I think the micro-progessions are something I really want to think about and start to create this year. I have shown my students examples and non-examples of the work I want them to do, but never been explicit about how they can move to the next level. I would love to see how this works with my students. Glad you have joined the conversation. The quotes you chose are so powerful. I agree that the bonus chapter gives us the real push to try it out. Looking forward to the next couple chapters. It definitely was hard to choose. Kate and Maggie have a wonderful way of writing! I am looking forward to next week's reading as well. This is my first time participating in #cyberPD. I always said I was going to but never finished. "When students use these tools they will have a greater opportunity to engage in decision-making about their work and their learning and help them be in control of their own learning giving them a sense of agency." I love this line because it is the key to these tools being effective. It's essential that we empower students and help them gain a sense of agency. When we give students opportunities to make decisions they can truly learn to be independent.